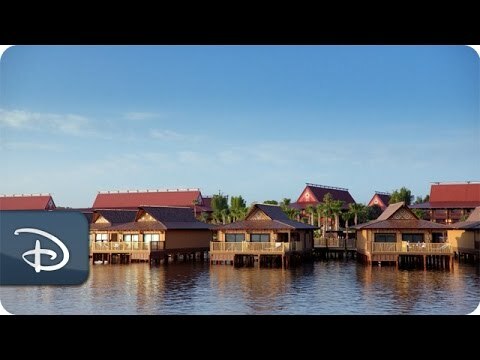 Tropical gardens, lavish luaus and calm waves characterise Disney&apos;s Polynesian Village Resort. Gentle people, laughter and good cheer help every member of the family to capture that laid-back South Pacific mood in no time at all. Rooms are airy and have a tropical feel with bamboo and wood décor. When exploring the resort, tell the kids to look out for the unique Kukai Nut tree. The only one of its kind in the state of Florida, the tree was brought to the Walt Disney World Resort from its native Hawaii. The hotel is on the monorail system that will whizz you to the Magic Kingdom Park. Magic Kingdom Resort area. Driving time from airport: approx 30 minutes. 484 rooms and suites in eleven 2- or 3-Storey Longhouses with 1 lift in each. All have air-conditioning, cable TV with Disney Channel, safe, mini-fridge, hairdryer, iron and board. Standard Rooms with 2 queen-size beds or 1 king-size bed and a day bed, sleeping maximum 5 adults plus 1 child under 3 years in a cot. Lagoon View Rooms with 2 queen-size beds and a day bed, sleeping maximum 5 adults, or 2 adults and 2 children, plus one child under 3 in a cot. Please note: cots must be requested at time of booking. Use of the Walt Disney World Resort Transportation System is included in your stay. Complimentary standard parking for 2019. Self-parking available approx $24 including tax per night (payable locally, subject to change. This charge comes into effect from 1 Jan &apos;20). &apos;Ohana Restaurant (character breakfast or dinner with storytelling), Disney&apos;s Spirit of Aloha (dinner show), Trader Sam’s Grog Grotto and Tiki Terrace, Oasis Bar & Grill (poolside), Pineapple Lanai (quick service), Capt. Cook&apos;s (quick service), Kona Island and Kona Café. Tambu Lounge - Great Ceremonial House (lounge) and Barefoot Pool Bar. Main pool with whirlpool, quiet pool with whirlpool and water play area. Games arcade*. Playground. Jogging trail. Movies under the stars. Campfire activities. Motorised boat rentals*. Fishing*. Volleyball. Healthclub with spa services* (located at Disney&apos;s Grand Floridian Resort & Spa). Disney-themed shop. Complimentary WiFi. Disney Water Transportation to Magic Kingdom Park. Disney Monorail Transportation to Magic Kingdom Park (one transfer takes you to Epcot). Disney bus transportation. Minnie Van service*. Laundry and dry-cleaning services*. Babysitting service*. Room service*. Please note: rollaway beds are no longer available. From the theming to location to service this resort was awesome. The whole family enjoyed our time here. All the staff we interacted with were spectacular. The kids enjoyed being able to hop on the monorail and head to Magic Kingdom or Epcot. The breakfast with Lilo and Stich was our favorite character breakfast of the trip. The Luau is great. Feels like you are in Hawaii. The dances are performed beautifully. Each one tells a story. The servers were very attentive and the food was delicious as expected. Enjoyed it very much. Come hungry.